Zippy Starburst is undoubtedly the biggest rock legend on this side of the Galaxy, ever since he started touring in the mid 3570's. His long and colorful history includes the introduction of head-tentacle banging and the ground-breaking album 'The rise and rise of Zippy Starburst and the Worms from Sorona'. 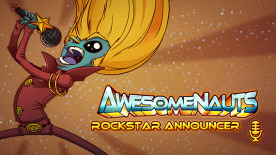 It turns out Zippy is a big fan of the Awesomenauts and their robot-blasting adventures. So when asked to commentate some of the recent battles taking place, he was happy to oblige. And as with everything Zippy does, he gave it his all.